"No wine can be regarded as unimportant, my friend, since the marriage at Cana" - Graham Greene. I had to google 'the marriage at Cana', turns out it was when that bearded bloke turned water into wine - you learn something new every day. I'm not sure what the wine tasted like when Jesus was around, but I agree with old mate Graham, no wine be it in a glass or a cask (or pouch) should be regarded as unimportant. 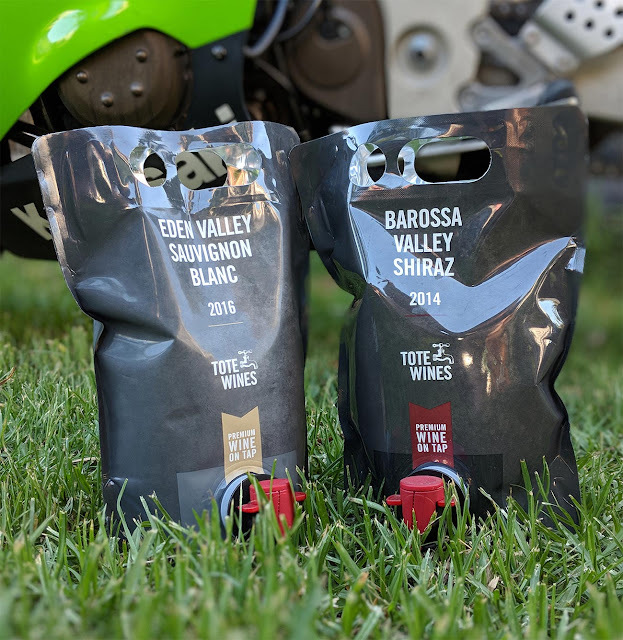 Tote Wines have given the humble 'goon sack' a refresh and have released a trio of premium Australian wines, Shiraz, Rosé and a Sauvignon Blanc. All marketed towards those with an active, outdoors lifestyle where the traditional glass bottle just isn't practical. That sounds like me, I thought, not so much the active part but I do like to get outdoors, and motorcycle camping is my thing. I often take a small bottle of whisky with me, especially in winter time, a good gulp or three at bedtime helps distance the cold. The problem with alcohol in a bottle is, you need to find a way to dispose of it. 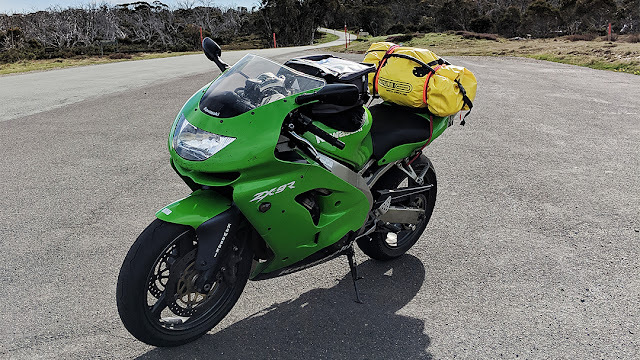 Travelling on a motorcycle means you have limited space, so the last thing you want to do is carry excess rubbish around. And unfortunately no matter how big the flames, the campfire is never going to be hot enough to melt glass. So with that in mind, the Tote Wines marketing speel started to make sense. A click or two later and my 'premium' pouches of wine were on their way. Instead, I judge my wine on the crudeness of the hangover and red wine, be it a $10 bottle or a $100 bottle, to date has been responsible for the most savage of all headaches. 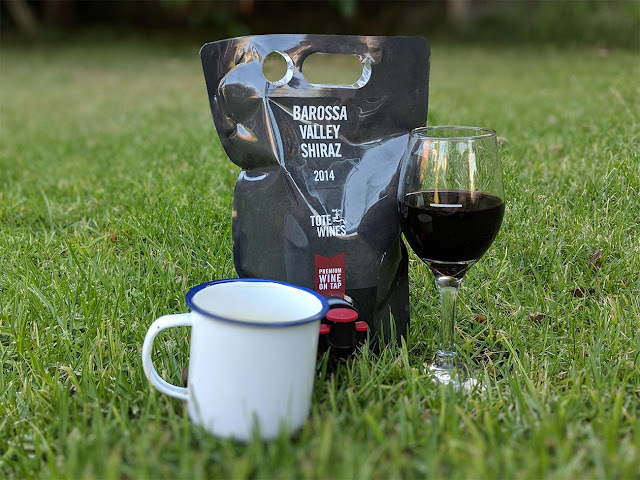 Here I had 1.5L of Tote Wines prime pouch, a 2014 Barossa Valley Shiraz. It was 34c outside, and I possessed a quenchless thirst from my commute home on the bug, dress for the slide, not the ride they say. Riding in leather makes a man thirsty. Perforating open the air-tight tap, glass at the ready, you appreciate the well thought out pouch, with holes for thumb and fingers, it helps steady the pour. You can also hang it on the handlebar of your motorcycle and pour from there - life hack. I let the wine air, I learnt that from watching Somm on Netflix. Gave it a swirl, a sniff, raised the glass and cheers 'up your bum and no baby' then sipped my first drop. It tasted great (articulate I know), with a very welcoming after-taste, so much so that by bedtime I'd absorbed about five glasses. I woke up the next morning without a hint of a hangover, headache or parchment. Tote Wines is no ordinary 'goon'. To me, a premium wine consumed in moderation shouldn't leave you feeling dusty the next day, and this is the first and only red wine I've had that's lived up to my 'premium' expectation. Well done to the winemaker and Tote Wine for producing a well-made product - premium wine on tap, not in a bottle. There's plenty of other benefits the Tote Wine brand offers, from shelf life, vegan & vegetarian approved to those who care about their carbon footprint - you can find that information on their website. And for us motorcyclists, there's the added benefit of a well-designed blow-up pillow. Now to indulge in the Eden Valley Sauvignon Blanc.